From left to right: Professor Robert Sneyd, Dean, Plymouth University Peninsula Schools of Medicine and Dentistry; Charlie Greensmith, Year 3 dental student; Professor Judith Petts CBE, Vice-Chancellor, Plymouth University; Sara Hurley, Chief Dental Officer (England); Olivia Barnard (Year 3 dental student); Ben Bradshaw MP, and: Professor Christopher Tredwin, Head of Plymouth University Peninsula School of Dentistry. 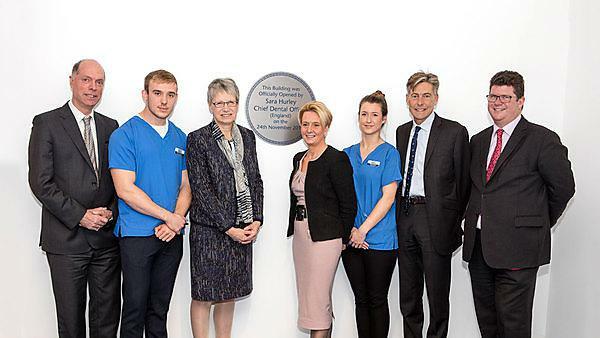 The Exeter Dental Education Facility has been officially opened by Sara Hurley, Chief Dental Officer (England) at an event where she was able to meet with patients, community groups, dental students and staff. “I applaud and admire the tenacity and vision that has brought this incredible dental care centre to fruition. What we have here is so much more than bricks and mortar, it is the spirit of best practice in care, in learning and in social enterprise. Recognising a need to improve access, the Exeter Dental Education Facility offers not only a place for excellent patient care but an outstanding environment for the high quality of training of the next generation of dental professionals. A true exemplar of enterprise and collaboration that will deliver quality time and time again." The Facility is used to train dental health profession students from Plymouth University and is run and managed by the Peninsula Dental Social Enterprise. It also provides a suite of postgraduate programmes, allowing local dentists and other dental health professionals to further their careers through education. The new facility replaces one that has operated within Heavitree Hospital since 2008. That facility, which was opened by Ben Bradshaw MP, had 16 dental chairs and provided early hands-on training for first year dental students, and dental hygiene and simple dental procedures for local NHS patients. "It was great to see the students learning in such state of the art facilities and the local patients benefitting from their care. The dental school has been a valuable asset for Exeter in recent years and it is wonderful to see it in such a fantastic, brand-new setting." There are four Dental Education Facilities in the South West, two in Plymouth and one each in Exeter and Truro. In an innovation in dentistry education, students treat NHS patients under the supervision of qualified dental professionals. As well as dental students there are also dental nurses and dental therapy and hygiene students. Since the first Dental Education Facility opened in Exeter in 2008, more than 18,000 people across Devon and Cornwall have received NHS dental care at the facilities, where they may not have had access to it before. An increase in capacity means that the new Exeter Dental Education Facility has 42 dental chairs and will provide a training environment for students from other years in the five-year dental and three-year dental therapy and hygiene undergraduate programmes. The new facility also has a 16-chair Simulated Dental Learning Environment, where students can hone their clinical skills on ‘smart’ dummies. The range of treatments available will initially include fillings, extractions, root canals and periodontal treatment for gums. Other treatments may become available in the future. Attending the opening were a number of patients who have received treatment from Plymouth University dental profession students. Alongside the clinical operations of the Exeter Dental Education Facility are those managed by the Community Engagement Team in the Peninsula Dental Social Enterprise. The role of the team is to engage with local community groups where there is oral health inequality and raise awareness of how to achieve and maintain good oral health, and how to access treatment when it is required from the Exeter Dental Education Facility.